Airlines canceled dozens of flights on Wednesday in the Southern U.S. as "life-threatening" Hurricane Michael approached Florida's Gulf Coast, packing 140 mph wind. The Category 4 storm was expected to make landfall on Wednesday. 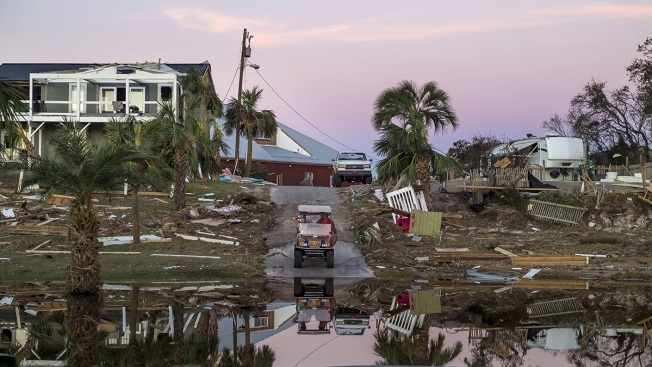 Federal forecasters warned that the storm could cause severe flooding along the Florida Panhandle and the Alabama coast as well as bring heavy rain through the Carolinas later this week. "In addition to the life-threatening storm surge and wind impacts, heavy rainfall is expected across a large portion of the southeastern U.S. along Michael's track," the National Hurricane Center said in a tweet. "These heavy rains are expected to extend well inland." Delta Air Lines and American Airlines scrapped date-change and cancellation fees, expanding waivers for travelers affected by the storm that were originally for five cities in Florida and Alabama to airports in Georgia and South Carolina. Hurricane Michael upgraded to extremely dangerous Category 4 storm from CNBC. Delta said in a note to customers that it does not expect "any impact to its operation at Hartsfield-Jackson as the storm is expected to remain southeast of Atlanta while winds and rain are forecast to remain within operational limits." The Atlanta airport is the world's busiest. Southwest Airlines does not charge customers a fee to change their travel dates but requires them to pay a difference in fare. Its customers who are booked in or out of 10 airports, including Atlanta, can change their dates without paying the surcharge if their flights are affected by the storm. Train travel was also disrupted. Amtrak said its Silver Star service from New York to Miami would operate only from Miami to Jacksonville, and a New York to Savannah route would operate be cut short at Washington, D.C., starting Wednesday "for the safety of our customers and employees."